Choose from two styles of handsome, sturdy Wooden Chess Sets, the #401 Book Chess Set and the #4348 Chess Set with a Hand-Finished Game Board. Each Chess Set comes ready for play with a Chess Board and Chess Pieces. Book (#401) – Our Book Chess Set has an inlaid self-storage walnut-finished book-style board. This chess set comes complete with weighted and felted chessmen. The king stands 2-1/2" high. The case when closed measures 12" x 6". Chess Set with Hand-Finished Game Board (#4348) – With its one-of-a-kind design, this Solid Wood Chess Set is sure to be a hit at your house. 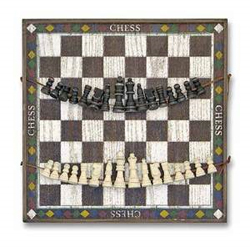 The set features a hand-rubbed finished Chess Board, hand-carved Chess Pieces that conveniently lace onto leather cords for storage, and a detailed instruction booklet. Heirloom quality, each Wooden Chess Set is crafted with exquisite detail and is designed to either hang on a wall or decorate an accent table. The Chess Game measures 1.5" x 16.5" x 16.5" and is recommended for players ages six and up. For more information on any of our Chess Sets or our Other Games, including Backgammon Sets , Checkers Sets, and Domino Sets , please contact us at 1-800-233-0282.